Description: Turtle on beach. Walking woman wearing white dress in background. Sun shining in relaxed atmosphere. Hawaiian nature scene with sea turtles, Big Island, Hawaii, USA. 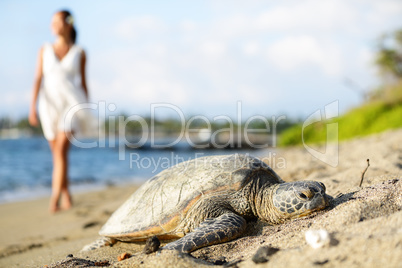 Royalty free photo Turtle on beach, walking woman, Big Island, Hawaii with a maximum resolution of 5760 x 3840 pixels. The image Turtle on beach, walking woman, Big Island, Hawaii is one of 23697 photos in the category Tiere and has been part of ClipDealer's stock since 16 Aug 2014 14:11:39. Turtle on beach, walking woman, Big Island, Hawaii is released for Kommerzielle und redaktionelle Nutzung.